In the one year that he has been in office, Prime Minister Narendra Modi has animated Indian foreign policy by taking a proactive approach on some critical issues and departing often from conventional methods and shibboleths. Modi’s recent China visit illustrated all the trademarks of his foreign policy—from pragmatism and lucidity to zeal and showmanship. It also exemplified his penchant for springing diplomatic surprises, with his announcement to grant Chinese tourists e-visas-on-arrival catching by surprise even his foreign secretary, who had just said at a media briefing that there was ‘no decision’ on the issue. Earlier, in Paris, Modi pulled a rabbit out of a hat by announcing a decision to buy 36 French fighter-jets. Modi, however, is a realist who loves to play on the grand chessboard of geopolitics. He is clearly seeking to steer foreign policy in a direction that would significantly aid his strategy to revitalise India’s economic and military security. At least seven things stand out about his foreign policy. First, Modi continues to invest considerable political capital—and time—in high-powered diplomacy. No other prime minister since independence participated in so many bilateral and multilateral summit meetings in his first year in office. The Congress party has criticised his frequent overseas tours, forgetting that Modi’s predecessor, Manmohan Singh, also loved to go abroad frequently. Critics, however, may have a point that Modi’s exceptionally busy foreign- policy schedule leaves him restricted time to focus on his most-critical responsibility: domestic issues, which will define his legacy. Indeed, some of his trips could have been better timed. Take his Sri Lanka visit in March, the first by an Indian prime minister to that country in 28 years. India’s neglect of Sri Lanka and the larger Indian Ocean region has become the strategic gain of China, which is now seeking to challenge India in its own maritime backyard. A prime ministerial visit to Sri Lanka was long overdue. But Modi chose to travel to Colombo barely a month after President Maithripala Sirisena’s India tour. Modi could have delayed his trip to Sri Lanka until after the forthcoming parliamentary elections there had cleared up the political scene. Similarly, what was the need for Modi to undertake a China tour barely eight months after Chinese President Xi Jinping’s India visit, a trip that was marred by a major Chinese military incursion into the Chumar region of Ladakh? The early return visit left limited time for preparatory work to achieve tangible and enduring results. The reason Modi went to China is that he had sentimentally promised Xi in India that he would visit China before the end of his first year in office. In that sense, Modi was chasing his own artificial deadline, which left little time for groundwork to make his trip authentically path-breaking. Modi has lined up several more foreign tours in the coming months, including an important visit to Bangladesh, which under Prime Minister Sheikh Hasina Wajed is standing up to jihadism. Sheikh Hasina, a friend of India, is one of the few leaders in today’s world unafraid to take on violent Islamists, even as she fights to retain control of the country. Second, pragmatism is the hallmark of the Modi foreign policy. Nothing better illustrates this than the priority he accorded—soon after coming to office—to adding momentum to the relationship with America, despite the US having heaped visa-denial humiliation on him over nine years. He has also gone out of his way to befriend China, negating early assumptions that he would be less accommodating of Beijing than his predecessor. He even delayed his Japan visit by several weeks so that his first major bilateral meeting was with Xi on the sidelines of the BRICS summit in Brazil. Modi has sought to rope in China, with its overflowing foreign-exchange reserves, as an important partner in India’s infrastructure development, like Japan. But it is unclear whether Modi’s gamble will pay off, given China’s interest in pushing exports, not investment, which remains insignificant in India. The much- publicised contracts signed during Modi’s visit are largely about Chinese state-owned banks financing Indian companies to buy Chinese equipment. This would likely widen India’s already-mammoth trade deficit with China, now nearing $50 billion. Third, Modi is shaping a non-doctrinaire foreign-policy approach powered by ideas. He has taken some of his domestic ideas (such as ‘Make in India’ and ‘Digital India’) to foreign policy, as if to underscore that his priority is to revitalise India’s economy. By simultaneously courting Xi, US President Barack Obama, Russian President Vladimir Putin, Japanese Prime Minister Shinzo Abe and other world leaders, Modi wants to demonstrate his ability to forge partnerships with rival powers and broker cooperative international approaches in a changing world. This suggests that the Modi foreign policy is geared to move India from its long-held non-alignment to a contemporary, globalised practicality. In essence, this means that India, a founding leader of the non-aligned movement, could become multi- aligned. Building close partnerships with major powers to pursue a variety of interests in diverse settings will not only enable India to advance its core priorities, but will also help it preserve strategic autonomy in keeping with its long- standing preference for policy independence. Non-alignment suggests a passive approach, including staying on the sidelines. Being multi- aligned, on the other hand, permits a proactive approach. 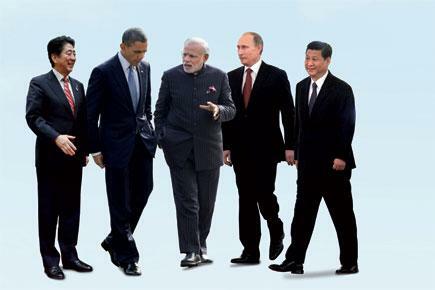 A multi-aligned India will tilt more towards the major democracies of the world. Yet a multi-aligned India will continue to be scrupulously autonomous in its foreign policy. An example of how India freely charts its own course is its continued refusal to join American- led financial sanctions against Russia. A multi-aligned India also will not shy away from building strategic partnerships with countries around China’s periphery to counter that country’s India-containment strategy. Modi’s early focus was on diplomatically recouping India’s regional losses by re-engaging countries in the nation’s strategic backyard. Even as that goal remains a priority, India is seeking to advance its ‘Act East’ policy, as Modi’s Mongolia and South Korea visits signal. Fourth, zeal is to Modi’s diplomacy what Sun Tzu precepts are to Chinese diplomacy. In that sense, Modi is following in the footsteps of his predecessors, other than Indira Gandhi. Talleyrand, the illustrious foreign minister of Napoleon and the Bourbons, prescribed one basic rule for a sound foreign policy: ‘By no means show too much zeal.’ Gushy expectations and oozing zealousness, however, have been the bane of Indian foreign policy almost since independence. Modi wore his zeal on his sleeve during the China visit. While his hosts uttered a couple of carefully crafted sentences on why India-China cooperation would be mutually beneficial, Modi waxed eloquent on this theme ad nauseum at every public event, including while addressing the expatriate Indian community. The Prime Minister effectively turned Jawaharlal Nehru’s ‘Hindi-Chini bhai bhai’ jingle into ‘Modi-Chini bhai bhai’, among other things, by describing his friendship with Xi as ‘plus one’. Modi’s zeal also tends to translate into diplomatic showmanship, reflected in the kind of big- ticket speeches he has been making abroad to chants of ‘Modi, Modi’ from the audience. Like a rock star, he unleashed Modi mania among Indian diaspora audiences by taking the stage at New York’s storied Madison Square Garden in September 2014, at Sydney’s Allphones Arena in November, and then in April at Ricoh Coliseum, a hockey arena in downtown Toronto. When permission was sought for a similar speech in Shanghai, an apprehensive Chinese government, which bars any public rally, relented only on the condition that the event would be staged in an indoor stadium. Fifth, Modi has injected a personal touch to propel Indian foreign policy. Indeed, Modi has used his personal touch with great effect, addressing leaders ranging from Obama to Xi by their first name and building an easy equation with them. Indian diplomacy now bears Modi’s distinct imprint. In keeping with his personaliszed stamp on diplomacy, Modi has relied on bilateral summits to open new avenues for cooperation and collaboration. At the same time, as if to underscore his nimble approach to diplomacy, he has shown he can think on his feet. The speed with which he rushed aid and rescue teams to quake-battered Nepal, as well as the Indian forces’ evacuation of Indian and foreign nationals from Nepal and conflict-torn Yemen, helped raise India’s international profile, highlighting its capacity to respond swiftly to natural and other disasters. Sixth, against this background, it is scarcely a surprise that Modi has put his stamp on foreign policy faster than any predecessor other than Nehru. The paradox is that Modi came to office with little foreign-policy experience, yet he has demonstrated impressive diplomatic acumen, including the bold steps taken and vision charted to reclaim India’s lost strategic clout. Seventh, to be effective, diplomacy must operate on the principle of give-and-take. But successive Indian prime ministers have chosen to operate lopsidedly on the half principle of ‘give’. There are plenty of examples of how unilateral magnanimity has backfired, saddling future Indian generations with serious strategic problems— from taking the Kashmir issue to the United Nations to reserving more than 80 per cent of the waters of the six-river Indus system for Pakistan by signing a treaty of indefinite duration. Even a strategy-minded Indira Gandhi blundered at the Simla Peace Summit in spite of holding all the cards. Modi can certainly take credit for crafting a sensible and shrewd foreign policy. Yet, despite having cultivated a muscular image, he is no exception to the Indian itch to concede unilaterally. To flaunt a bilateral summit as a ‘success’, Modi is at times willing to abandon—at the altar of diplomatic expediency—the basic tenets of statecraft, including reciprocity (the first principle of diplomacy) and leverage. Examples of Modi being a Mr Giver range from concessions to America on the nuclear-accident liability of reactor vendors to reversing course and permitting the Pakistani high commissioner in New Delhi to meet Hurriyat separatists on any occasion other than when official Indo- Pakistan talks are about to begin. His China visit also illustrates this chink in his armour. The Chinese side did not yield on any issue, but Modi did. Overruling objections by the Indian security establishment, Modi announced the grant of e-visa-on-arrival on a non-reciprocal basis to Chinese tourists. So, even as China issues stapled visas to Indian citizens living in Arunachal Pradesh, India has agreed to reward it with that facility. The announcement, made at Beijing’s Tsinghua University, made Chinese Foreign Minister Wang Yi so happy that he asked the assembled students to loudly cheer and thank Modi for the ‘gift’. As in September during Xi’s visit, Modi also yielded on Tibet, with the joint statement in Beijing referring to the ‘Tibet Autonomous Region of the People’s Republic of China’ in the context of Indian pilgrims’ visits to the sacred Kailash-Mansarovar site. ‘Tibet Autonomous Region’ is China’s official name for truncated Tibet, even though there is nothing autonomous about a region that is brutally repressed and ruled directly by Beijing. Referring to Tibet as part of the PRC undercuts India’s revised policy since 2010 to refrain from such a depiction in any joint statement as long as China persists with its cartographic aggression against India. The urge to project a summit as a resounding success or to please the other side is often the main driver for India to yield. This is an urge Modi must learn to resist. After all, he is pursuing a foreign policy that, taken as a whole, is smart, realistic and forward-looking. Modi must bear in mind that institutionalised and integrated policymaking are essential for India to have a robust diplomacy and to be able to stay its course. Without the health of these processes, policy will tend to be ad hoc and shifting, with personalities at the helm having an excessive role in shaping thinking, priorities and objectives. If foreign policy is shaped by the whims and fancies of personalities who hold the reins of power, there will be a propensity to act in haste and repent at leisure, as has happened in India repeatedly since the Nehruvian era. Diplomacy is largely about negotiations. India must develop a tradition and culture of hard bargaining. Also, no country’s diplomacy can afford to confound tactics with strategy or marginalise its national-security establishment. The political ascent of Modi, a man known for his decisiveness, can be a game-changer for Indian foreign policy if diplomacy is anchored in goal-oriented statecraft. After a decade of drift and neglect, India, under Modi’s leadership, is actively involving itself regionally to help influence developments in its strategic backyard. Modi realises that big-bucks corruption can enfeeble internal security and crimp foreign- policy options, and is seeking to bring this scourge under control. The Prime Minister seems to recognise that he can sustain a dynamic foreign policy only on the foundation of a strong domestic policy, a realm where he must overcome political obstacles to shape a transformative legacy. Brahma Chellaney is a geostrategist and the author, most recently, of Water, Peace, and War (Rowman & Littlefield, USA).